We travel to Yellowstone National park in Lower Falls. This is my third 45" X 45" painting and I must say I am beginning to really enjoy working this large. I poured the acrylic paint to get it started then came in with a brush for finishing work. By reducing the amount of time a brush touches the paper, the amount of glow when the light bounces off the paper is really enhanced. 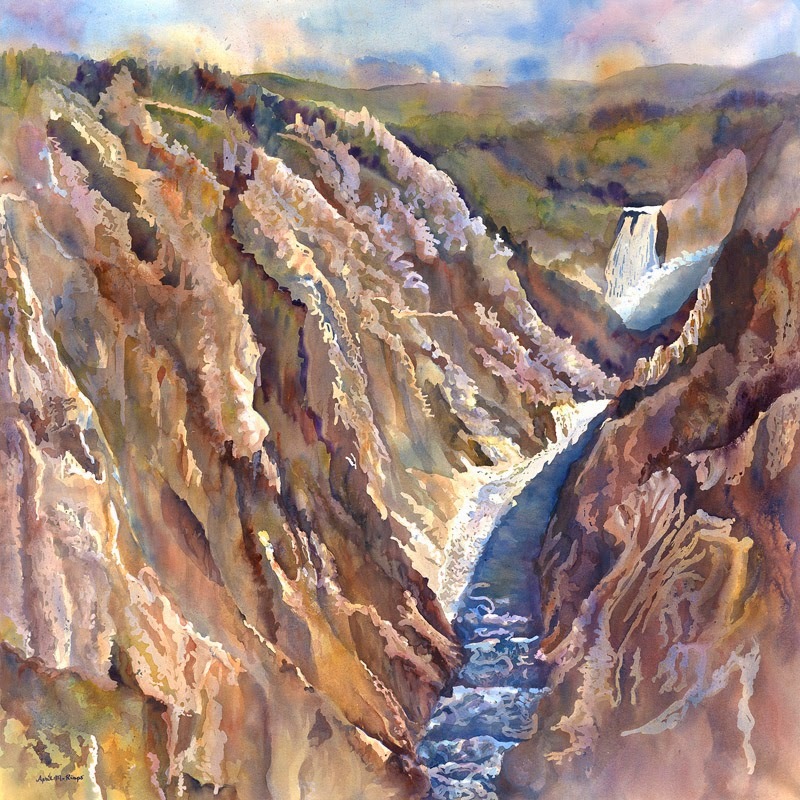 I loved how the yellow in Yellowstone National Park really pops on the light side of the canyon but becomes subdued with blue and burnt sienna tones on the shadowed side. The river too goes from nearly white where it reflects the light on the bright side to deep blues and purples in the shade. It is like there are two worlds hidden in one. The deep canyon lets us see both of these worlds at once. Pouring Paint - "Back to the Barn" and "A Harder Time"
Moving Up was created by pouring fluid acrylic paint on watercolor paper. This image was designed to be gallery wrapped, where the image of the cliffs wraps around the edges. As a result no frame should be used with this painting. The artwork becomes part of your room as it projects 1.75" off the surface of the wall. 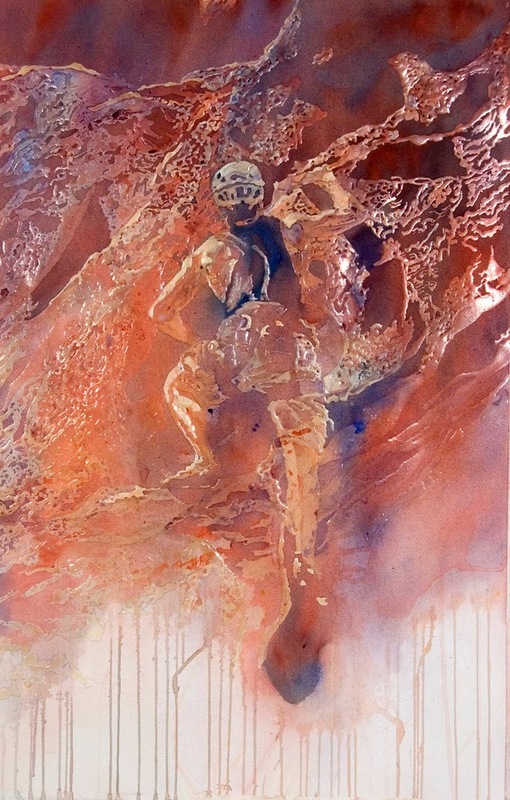 I built up the depth of color of the cliff and the rock climber's form through progressively darker layers of poured acrylic. I thin out the fluid acrylic to be much like a thin wash of watercolor so I can gradually build transparent layers. Masking fluid is applied to block out areas that I want to retain from each pouring. I especially like areas where the difference in value (The lightness or darkness of tones or colors. White is the lightest value: black is the darkest.) is minuscule between layers allowing me to create very subtle and interesting patterns, like in this closeup detail of the cliff. 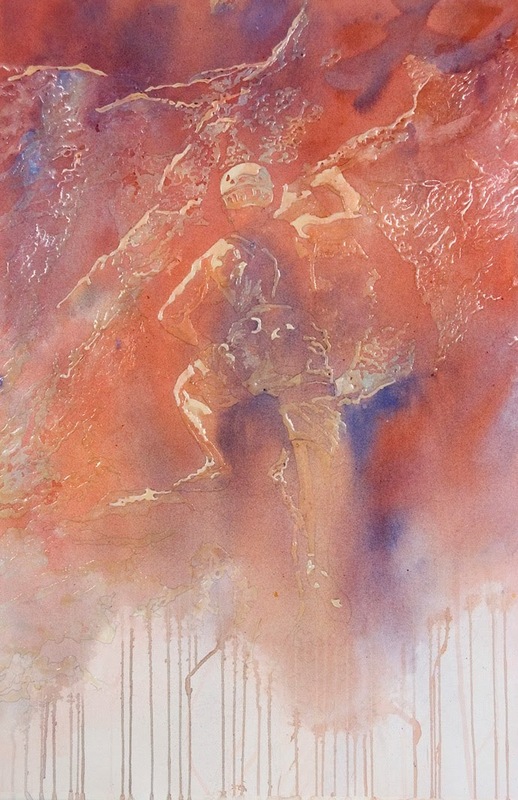 At the bottom of the post I've added three photographs of the painting I took during its evolution so you can see how the painting changes from an abstract, to a shadow of the figure, to a more developed figure and cliff. Three layers of mask and paint were applied when the third photograph was taken. An additional three or four layers were needed to finish the painting and add some finishing touches. 23rd Annual ISEA (International Society of Experimental Art) International Art Exhibition. 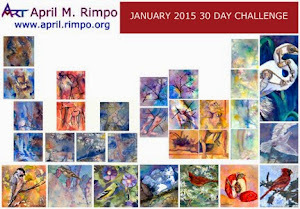 You can see it from September 13th to October 12th, 2014 at the National Watercolor Society Gallery in San Pedro, CA. It was also included in North Light Publications Best of Acrylic book, AcrylicWorks3: Celebrating Textures. 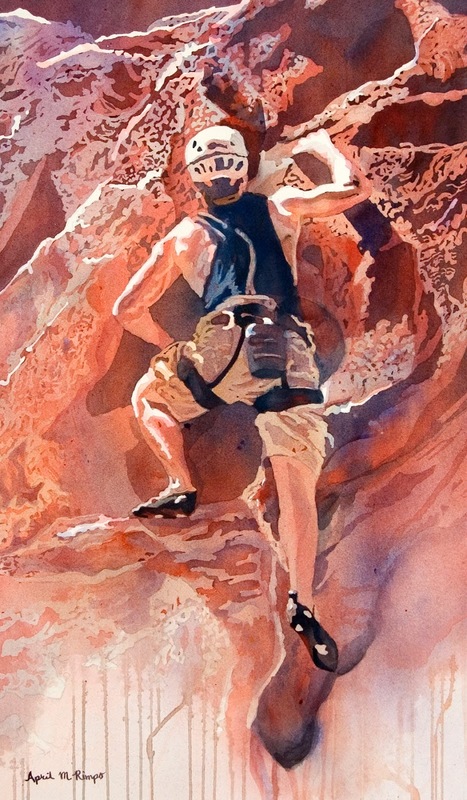 You can see another painting of rock climber in my post The Apex. 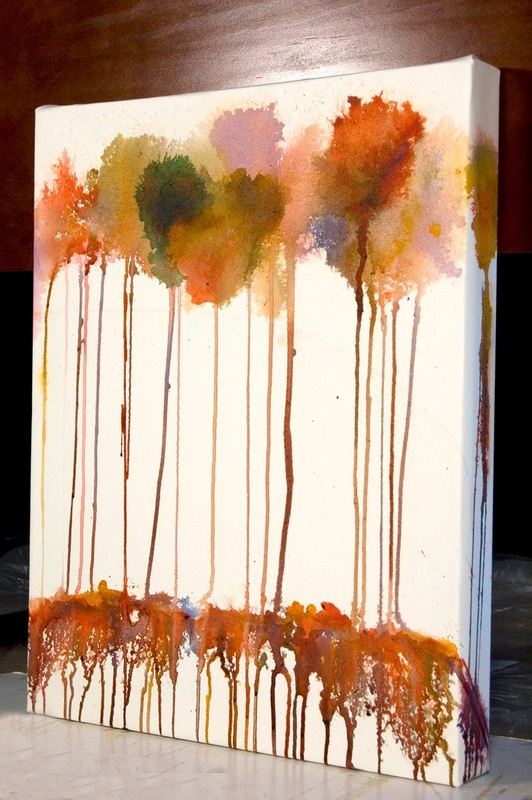 That painting was created using fluid acrylic and watercolor, but the paint was not poured. A little whimsy to brighten your day in Standing Tall. 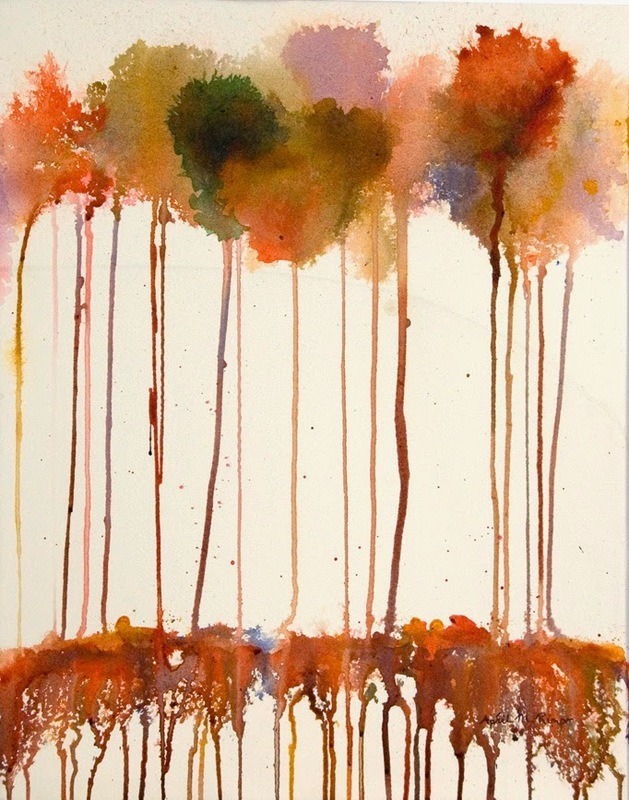 These multicolored trees tower above the ground, so tall you can see a bit of the curvature of the earth. Their roots intertwine and reach deep, anchoring the trees for all time. Part of me feels fairies might live among these trees. * Contact April regarding purchase outside the United States. Although we live in the Baltimore/DC area, we are west enough to be in a farming community on a wooded lot where we are visited by deer, foxes, and raccoons. My husband is faithful to the birds, feeding them during the winter months to make sure they survive. The variety of birds is more limited in the Winter since many species have flown south, but the population of doves seems to increase. Lucky for us, some remain for the Spring and part way into Summer. 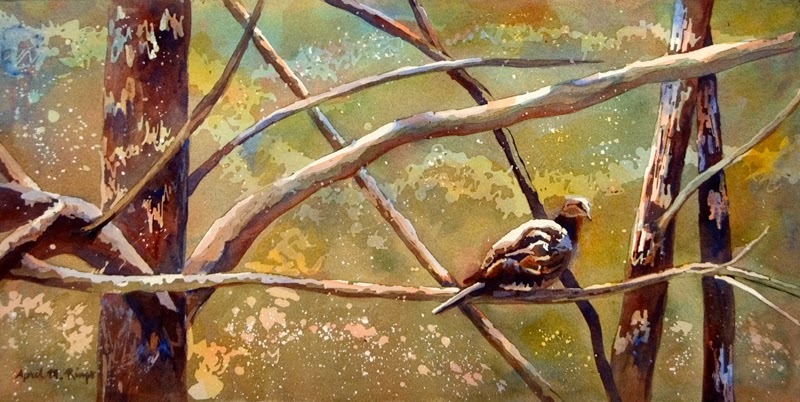 This dove did stay for Spring and one morning when looking out across our backyard I noticed her sitting on a tree limb; she looked as though she too was enjoying the quiet morning and the dapples of sun that had begun to sprinkle into the wooded area. A Time of Peace is intended to recapture the serenity I felt that morning looking out on the dove. For those of you who follow my posts regularly, you may recall I recently mentioned learning a watercolor technique where you pour the paint. In that post I said I wanted to try this approach with acrylics as well. This painting was my first journey down that path. I use fluid acrylic paint, which means the paint is thinned with water until it flows like watercolor. However, one major difference is that acrylics dry quickly and, once dry, are essentially permanent. They cannot be lifted off the paper as you can do with watercolors. In order to achieve the soft, nearly pastel look to this painting, I needed to use very dilute acrylic in each layer to keep the paint from getting thick and opaque. 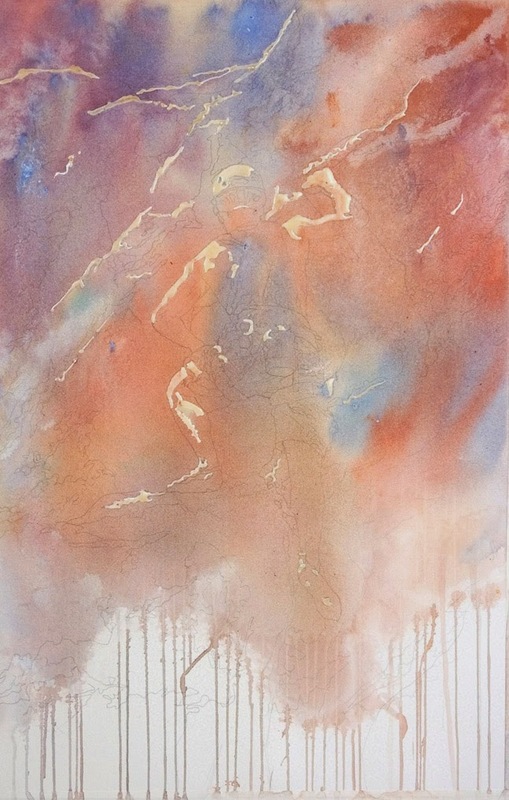 Using a light touch also allowed me to add layers of paint to change the hue in an area if I was not satisfied with an earlier pouring. I actually found I could accomplish pretty much the same result with the fluid acrylic as with the watercolor paint. I have also learned that I very much like using a pipette to spread the paint around the paper since it is easier to control how much paint I apply. When truly pouring from a container, I have occasionally gotten too much paint and then it can be difficult to remove the excess quickly enough, especially with acrylic. I'm sure I'll continue to use pouring (or maybe I should say "pipetting") in my acrylic paintings since I like the random colors in the washes and the extra glow that I can achieve.